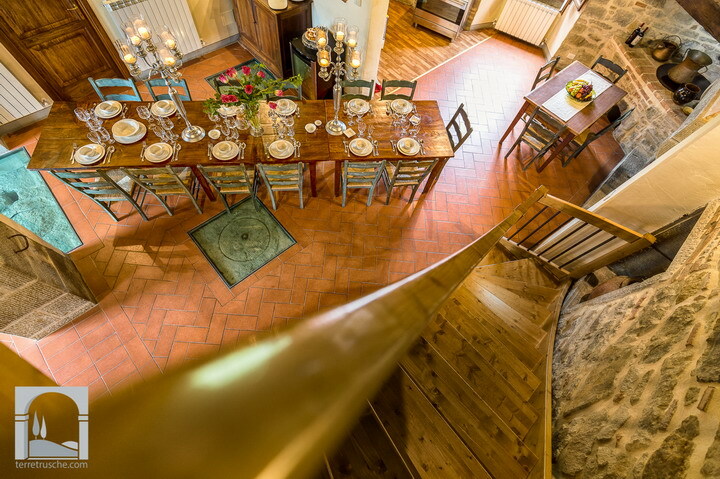 Villa Fontocchio is situated at the foot of the Etruscan town of Cortona, in an enchanting location among vineyards and olive trees. 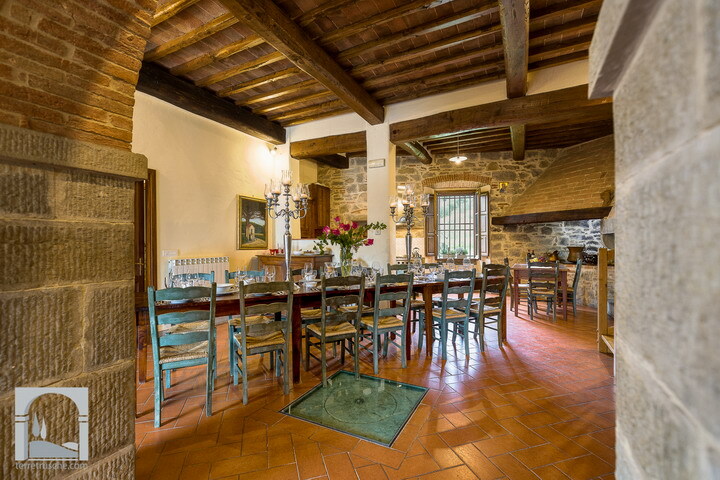 Thanks to the careful restoration works, the charm of this typical Tuscan farmhouse, with its wooden beams and terracotta floors, has been preserved. 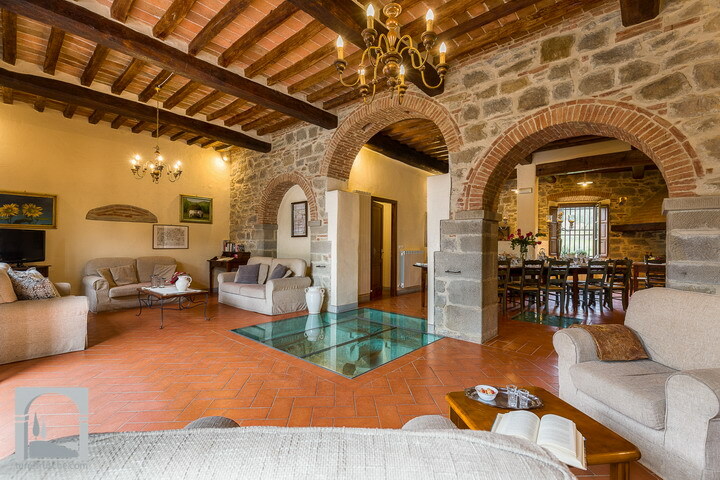 A big gate leads into a spacious living room. 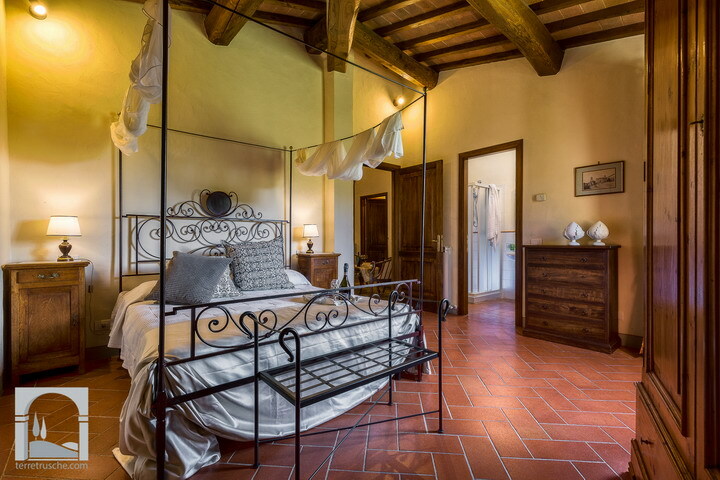 Here, in the heart of the house, the wooden beams, the original fireplace, the typical Tuscan furnishings, the elegant curtains and the ancient printings create a harmonious whole. 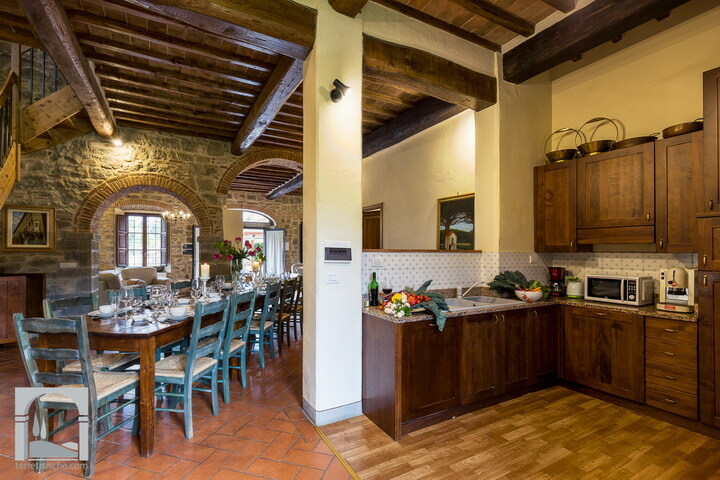 The cosy kitchen, dominated by a big Tuscan table, provides any comfort. In the middle of it lies a large brick fireplace, where poor farmers used to warm up their meal. 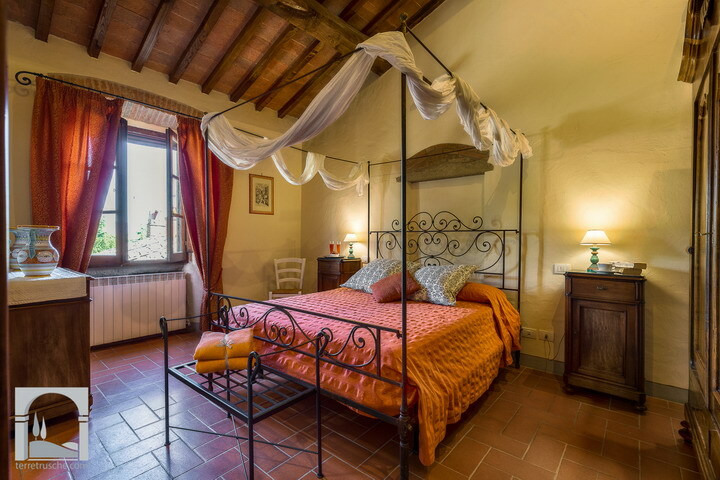 The eight bedrooms are carefully furnished according to different refined styles and are characterized by precious curtains, baldachin and wrought iron beds. Five double bedrooms have ensuite bathroom with shower or tub, while the other 2 double bedrooms and the single share two spacious bathrooms with shower. Two extra beds can be added upon request. 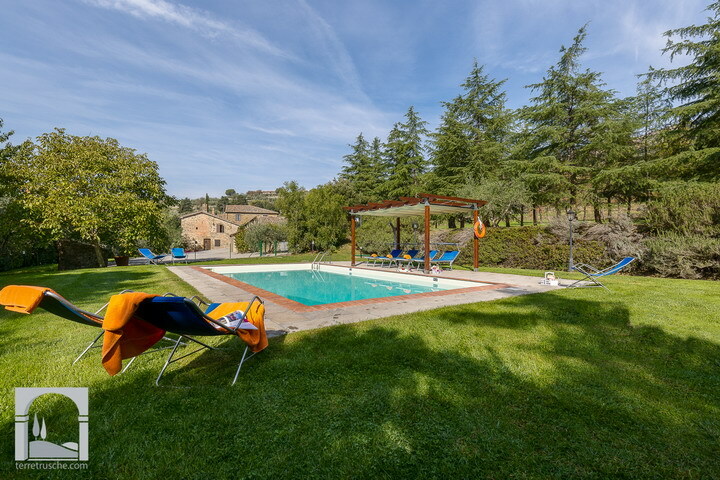 The wide surrounding garden hosts a large swimming pool that can be used exclusively by the Villa's guests and is fully furnished. 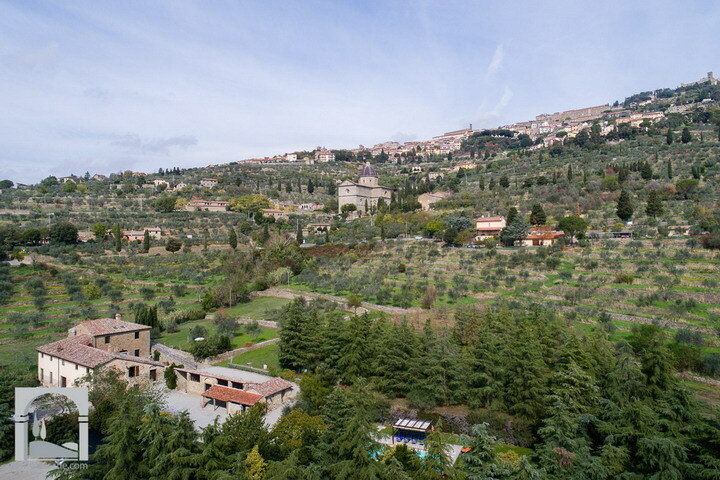 Here you will enjoy peace and relaxation as well as a stunning view of the beautiful city of Cortona. 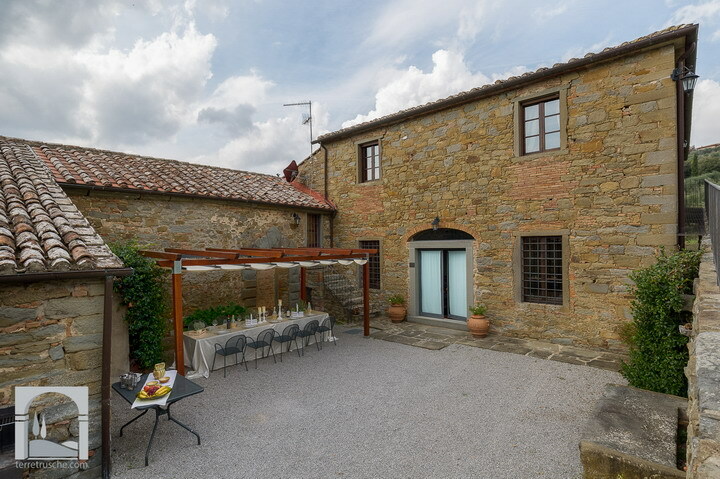 Here you will have the chance to relax among the characteristic colours and smells of the Tuscan countryside. Nous ne regrettons pas du tout d'y être aller pour la deuxième année consécutive. 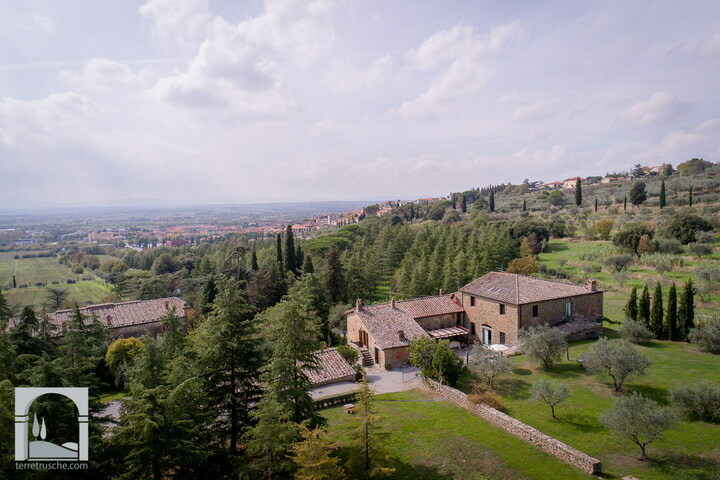 Cette villa est très agréable à vivre et nous avons pu visiter ce que nous n'avions pu faire l'année dernière.j'ai d'ailleurs conseillé à beaucoup d'amis interessés par la Toscane de prendre contact avec vous. Security deposit: € 600.00 cash payable to key-holder on arrival. The deposit will be fully refunded after inspection on check-out day.